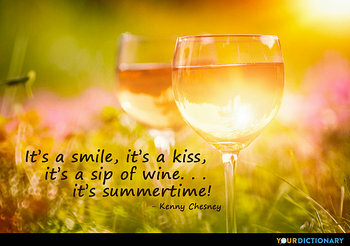 It's a smile, it's a kiss, it's a sip of wine...it's summertime!  As qutoed in A Mother's Love: Beautiful, Unconditional, ...and Forever (2017, pg. 273). Upon thy cheek lay I this zealous kiss, as seal to this indenture of my love.  William Shakespeare, King John (1598), Act II, scene 1, line 19.  Jonathan Swift, Polite Conversation, Dialogue II. But, thou know'st this, 'tis time to fear when tyrants seem to kiss.  William Shakespeare, Pericles, Prince of Tyre (c. 1607-08), Act I, scene 2, line 78. And he that betrayed him had given them a token, saying, “Whomsoever I shall kiss, that same is he; take him, and lead him away safely.” And as soon as he was come, he goeth straightway to him, and saith, “Master, master”, and kissed him.  Christian Nestell Bovee, Intuitions and Summaries of Thought (1862), Volume I, p. 240. Four sweet lips, two pure souls, and one undying affection, these are love's pretty ingredients for a kiss.  Christian Nestell Bovee, reported in Maturin M. Ballou, Pearls of Thought (1882), p. 142. When age chills the blood, when our pleasures are past. For years fleet away with the wings of the dove, the dearest remembrance will still be the last. Our sweetest memorial the first kiss of love.  Lord Byron The First Kiss of Love, stanza 7 (1806). It was thy kiss, Love, that made me immortal.  Margaret Fuller, Dryad Song (1900). I can express no kinder sign of love, than this kind kiss.  William Shakespeare, Henry VI, Act i, scene 1. Thy lips which spake wrong counsel, I kiss close.  Elizabeth Barrett Browning, Drama of Exile, scene Farther on, etc, line 992. I was betrothed that day; I wore a troth kiss on my lips I could not give away.  Elizabeth Barrett Browning, Lay of the Brown Rosary, Part II. The kiss you take is paid by that you give. The joy is mutual, and I'm still in debt.  George Granville, 1st Baron Lansdowne), Heroic Love, Act V, scene 1. I rest content; I kiss your eyes, I kiss your hair in my delight: I kiss my hand and say "Good-night."  Joaquin Miller, Songs of the Sun-Lands. Isles of the Amazons, Part V. Introd. St. Drink to me with thine eyes alone; or if thou wilt, having put it to thy lips, fill the cup with kisses, and so give it me.  William Shakespeare, As You Like It (c.1599-1600), Act III, scene 4, line 17. 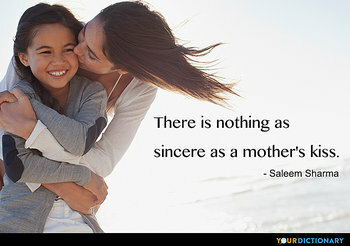 Teach not thy lips such scorn; for they were made for kissing, lady, not for such contempt.  William Shakespeare, Richard III (c. 1591), Act I, scene 2, line 172. As in the soft and sweet eclipse, when soul meets soul on lover's lips.  Percy Bysshe Shelley, Prometheus Unbound.  "Spell Bound" (2012), said by Sophie and Archer. How lovely it was, that first kiss of Jesus in my heart — it was truly a kiss of love.  Roman Catholic French Discalced Carmelite nun (1873 - 1897), talking about her First Holy Communion.